This is the first study to provide a systematic and thorough investigation of continuo realization styles appropriate to Restoration sacred music, an area of performance practice that has never previously been properly assessed. Rebecca Herissone undertakes detailed analysis of a group of organ books closely associated with the major Restoration composers Purcell, Blow and Humfrey, and the London institutions where they spent their professional lives. By investigating the relationship between the organ books' two-stave arrangements and full scores of the same pieces, Herissone demonstrates that the books are subtle sources of information to the accompanist, not just short or skeleton scores. Using this evidence, she formulates a model for continuo realization of this repertory based on the doubling of vocal parts, an approach that differs significantly from that adopted by most modern editors, and which throws into question much of the accepted continuo practice in modern performance of this repertory. 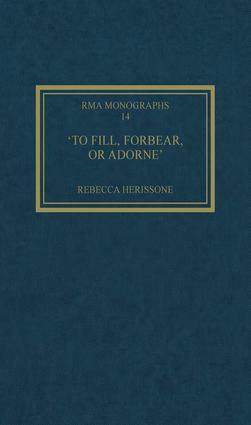 Contents: Preface; Introduction; The principal characteristics of Restoration organ books; Alteration and addition of material; Distinctions between different genres and sections; Incomplete right-hand parts and figured-bass parts; The unusual case of Matthew Locke; Conclusions; Appendix; Bibliography; Index. Rebecca Herissone is Lecturer in Musicology in the School of Arts, Histories and Cultures at the University of Manchester, UK.